Marshall Exteriors provides high-quality sunroom design and installation in The Greater Finger Lakes Area, and we can help you add the perfect living space to your home. We install a variety of styles of sunrooms, and we will work with you to find the perfect custom design for your home. We offer free quotes on all our sunroom installations in Geneva, Newark, Canandaigua, Fairport and nearby New York, so call us today at 1-855-237-7177 or click below to get started! Why choose Marshall Exteriors for your sunroom needs? Four season vinyl sunrooms by Betterliving Sunrooms come with insulated glass and construction to make your new sunroom accessible year-round. 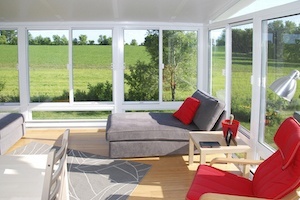 This sunroom is available in several colors and studio roofs or gable roofs. 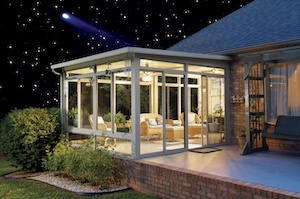 A three season aluminum sunroom is an easy, affordable way to bring the outdoors into your home. Choose the glass type, color, and roof style depending on your tastes and budget. Shade protection in the form of awnings, shades, and pergolas can further enhance your property's outdoor experience by extending livable space. A screen room will keep out insects so that you can enjoy outdoor living comfort with family and friends. With a retractable motorized screen, you can lower it when bugs are bad and take it away when it's no longer needed. If you want to upgrade your home with a custom sunroom installation, Marshall Exteriors are the local contractors you need! We design and install all types of custom sunrooms, and we will work with you to ensure that you get the perfect space for your needs. Call us today at 1-855-237-7177 or contact us online to get a free estimate on a sunroom installation for your home. 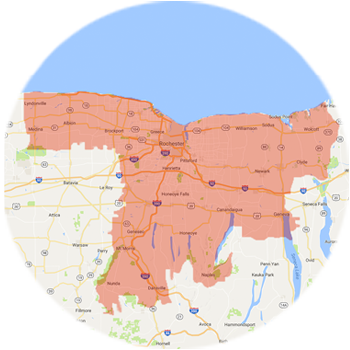 We proudly install Betterliving Sunrooms & Awnings in Canandaigua, Fairport, Newark, Geneva, Victor, Ontario, Farmington, Macedon, Rochester and throughout the surrounding areas.